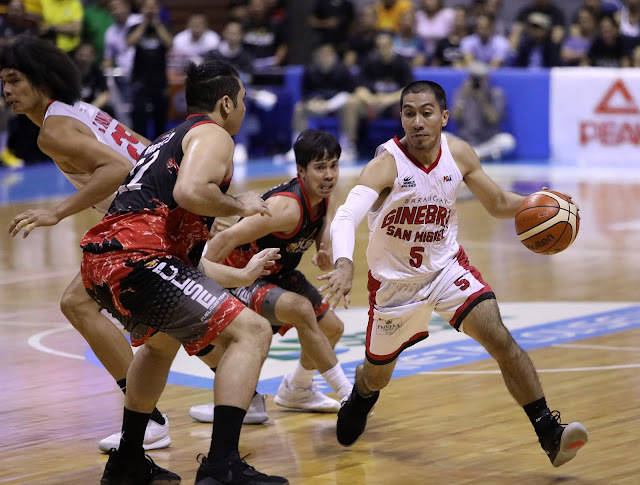 PASAY—By playing in his 596th consecutive game on Sunday night, LA Tenorio tied Alvin Patrimonio for the longest streak in the Philippine Basketball Association in which a player saw action. "It's a great achievement not only as a basketball player but as an athlete," said Tenorio. The Ginebra point guard never missed a single game so far into his 13 seasons in the league since San Miguel drafted him in 2006 as the fourth overall pick. "Para sa akin, malaking achievement ito kasi lahat ng pinaghirapan ko all throughout my career, not only in the PBA but also in high school, college—yung pinaghandaan ko para maging isang professional athlete—nasuklian," he continued. All the hard work, discipline, and sacrifices na ginawa, nagbubunga." He is set to break the "Iron Man" record next Sunday when the Barangay take on the Magnolia Hotshots—with current manager Patrimonio. But Tenorio looks to continue his streak beyond next week's "Manila Clasico". "It doesn't matter kung anong number. As long as I can play, I will play," Tenorio vowed.